I promised that I’d update with news of how the barrel-aged Vieux Carré (or “Ancién Carré”) turned out, so here we are. The significance of barrel-aging comes from the interaction between the liquid and the wood. Which is tediously obvious, except that it has one corollary that is worth noting: a smaller barrel means that there’s a higher ratio of surface area wood to liquid. Which in turn means that the adorable little barrel I had, 3 liters in volume and roughly the size of an adolescent cocker spaniel, ages things extremely quickly. I checked it at 5 weeks, and it needed just a little more. Then something more engaging must’ve happened, because I forgot about it for a while, suddenly panicking at 7 weeks that I had forgotten and ruined the whole thing, but to my surprise, it was perfect. Add ice cube; express oils of peel over the top of the drink; serve. I very nearly over-aged this, which would’ve been tragic, but as it stands, it’s perfect. At first, I tried to properly chill it via stirring on ice, and the flavors completely fell apart. I thought I had ruined it, until I made another one and added just one big cube of ice, unstirred, and let time do it’s work. The result, if I may say, is kind of amazing. The ingredients are top shelf, with such a long time in a small barrel bringing a new complexity and significant oak sweetness. The smell alone could end a war. It’s vanilla and fruit, the symphonic chord of cognac enhanced and deepened by the barrel with the rye adding just enough stiffness to be noticeable. 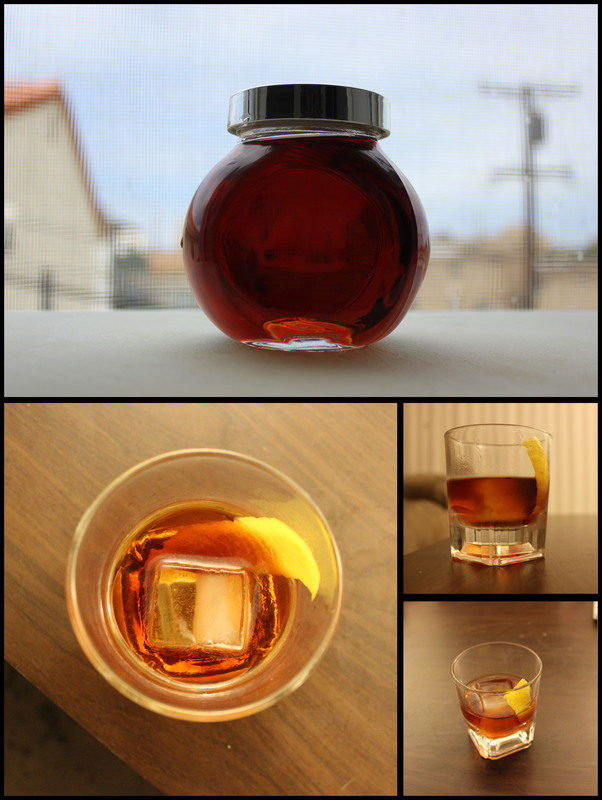 The basic Vieux Carré is delicate and full as it is, and this takes that, plugs it in, and cranks it to 11. This is a phenomenal drink. Tragically, I can’t give it to you, because we’ve already sold out. We started with a very small batch – if you remember, it was just going to be for me and my friends until I figured out how good it was – and the bar sold out of them already, so I can’t tell you where to get it. However, we are planning another batch (along with an exciting new barrel, if things work like they’re supposed to…), so either be good enough friends with me to have one of the 5 or so I’ve got left in my apartment, or look to URBN in about 8 or 9 weeks.